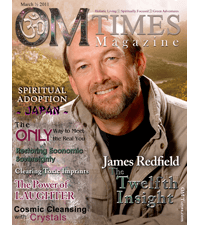 The second March 2011 edition of OM-Times Magazine, featuring James Redfield (author of The Celestine Prophecy series) on the cover, is now available online for your viewing. Thanks to OM-Times Magazine for producing a top quality, green metaphysical magazine twice a month. My section, CULTURAL CREATIVE ARTS begins on page 71 of this issue, and features an interview with Los Angeles based psychic, metaphysical teacher, writer, dancer and performance artist Forest Nui Cobalt. To view the interview and the rest of the magazine, go to: THIS PAGE and wait for it to load, it may take a minute. Have a great weekend everyone!